Perfectly nestled within the client’s elegant garden in the heart of East Ayrshire, Scotland, sits the beautiful Crow’s Nest Tree House. This wonderful hideaway has been designed to be rustic and charming in character, with a Cedar shingle roof and a combination of straight and organic lines to add to the visual appeal of the tree house. The entrance to The Crow’s Nest is truly magical, with a ramped timber boardwalk leading up to the inviting Oak framed double doors that welcome you into this magnificent little gem. The open-plan layout of the tree house allows for versatility of use, with a wonderful log burner taking centre stage offering a cosy environment to curl up with a good book on the bay window seat during the frosty winter months. During the summer months, the tree house transforms into a haven to relax and enjoy the delightful garden setting whilst listening to the sounds of the birds outside. Bi folding doors open out onto an elegant entertainment deck and the adjoining Crow’s Nest satellite deck that is accessed via a rustic rope bridge. The Crow’s Nest is a truly magical retreat to be enjoyed throughout the year, offering a perfect entertainment space for both family and friends. 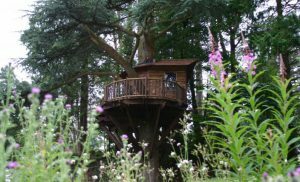 This picturesque treetops tree house is set in the beautiful Cumbrian countryside and was featured as part of Discovery Channel’s ‘Tree Team’ series. Blue Forest are delighted to have been appointed as the lead design consultants assisting in the creation of the Eden Project Aerial Walkway and developing Europe’s leading rainforest education resource at the Eden Project, Cornwall.